The Vedas appear to be the inspiration behind Indus seals because the theme of many such seals when analyzed appear to reflect Vedic contents. The seals are a faithful representation of Vedas. The Indus seals, also called Harappan seals depicting finely executed carvings, approximately dating as far back as 3500 years, are highly sophisticated heritage artifacts which mirror the religious, social and intellectual excellence of Indus valley civilization. The seals, many as tiny as 3cms / 3cms, and weighing nine to ten grams approximately were discovered in the vast expanse of Indus civilization sites of Harappa – Mohenjo-Daro and north western parts of India. The thousands of seals, unearthed in the Indus valley, depicted in most of them the picture of a bull with single horn and mysterious symbols inscribed. The existence of such an animal has not been found so far nor the symbols deciphered. These seals are the archaeological proof of the civilization that existed around 1500 B.C. It means: I praise Agni who is the Purohita, the well-wisher of community, who is the celestial priest, Ritvija and Hotaram– The invoking priest, who summons and invokes gods to enjoy the offerings. As a mediator between earth and heaven, Agni announces to the Gods about the Yajna with the sound of crackling flames and brings them down to the place of sacrifice. However, the leader Agni has to be invoked and kindled afresh before every Yajña. Intern, it is the ṚgVedic priest Hotṛ (one of the 4 principal priest )who chants the Mantras to invoke Agni. According to ṚgVeda, he is the Ṛtvij -the priest who officiate at a sacrifice. The status of the chief human priest who invoked Agni was all-powerful like the bull in the heard as he invoked and installed the deity Agni during yajnas. Hotri priest is depicted as a sacred and powerful animal, the bull, as addressed in Vedas. The status of the chief human priest was all-powerful like the bull in the heard who invoked the deity. Agni = Purohita = Priest. Priest = Bull or Vrishabha. Therefore, Agni = Bull. The ignitor of Agni = Hotri priest = Bull. The bull is called Vṛṣabha in Sanskrit. Vṛṣabha or vrisha relates to many meanings like – strong, vigorous, manly, mighty, the most excellent, eminent, best one, and so on. (Griffith,1973:683) . Ṛg Veda (3.27.15) compares Agni and the invoker of Agni -the human priest to Bull. Vrishanam tva, vayam vrishan Vrishanaha , samidhimahi, agne didyatam brihat. It means: “Thou Agni, art a bull that makes our store increase, to be invoked by the hotri priest, who knows what to offer, who lifts the ladle up and gives the formula of mantra while making offering.” Many stanzas of ṚgVeda (1.142.8) also mention about these two priests, who invoke the gods to be present in the yajna. Complete this sacrifice of ours, effectual, reaching heaven to-day”. There are many such quotes that support the logic in calling Agni. The igniter of Agni are the bulls, the priests, and hence have been symbolically carved in seals. Single horned bull is more a metaphor or symbolism, rather than a direct depiction of the domestic animal in art form. Why does the motif of bull have a single horn? The Indus seals with bull images are of three varieties: the single horned, double horned with bent head, and double horned with the big hump. Of the three types of bulls,only the single horned one shows the Kaṇḍūyanī. 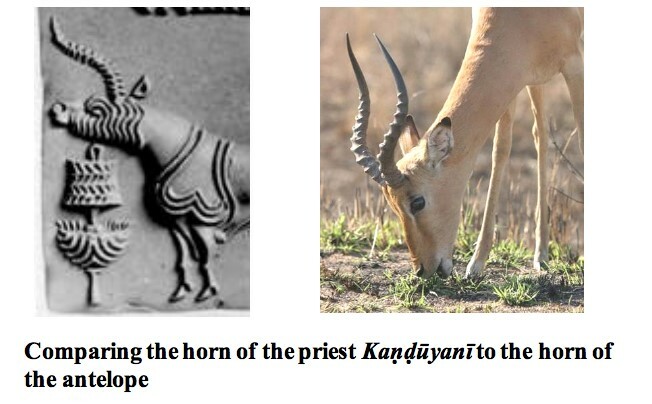 Kaṇḍūyanī , also called Viṣāṇa:is the horn of the antelope with multiple folds, used by the initiated priest as a tool to scratch the body when required (as scratching with fingers or nails was not permitted after initiation. Kaṇḍū in Sanskrit means an itching sensation. Yana means moving. The priest gets satisfaction when he moves kandu horn on experiencing itching sensation). Viṣāṇa and Kaṇḍūyanī are the terms which mean the horn of the antelope,one span in length, with three, five, or multiple folds called Trivṛt, Panchavṛt, etc., which is fastened to the sacrificer’s upper garment, by Adhvaryu priest at the time of Dīkṣā of Soma or other Yajña. The reason why Kaṇḍūyanī is shown in the forehead region of the bull is that with it the Dīkṣita priest, on entering the yajna shala, takes out the lump of earth from the Vedi and touches his forehead. After this, it is tied to the upper garment of the priest. Kaṇḍūyanī is the identification mark used by one who has taken initiation – Dīkṣā and his Pravaras (lineage of father and grandfather) are recited by the Adhvaryu priest. This is called Āvedana by which a declaration is made that the sacrificer or the priest has been consecrated. A priest adorned with the sacred thread was eligible to invoke Agni after his Dikṣā initiation. With the horn of the antelope he stamps the earth of yajnashala on his fore head and later it was tied to his upper garment. This single horn of the bull in the seal is the accessory object used by the priest. Hence, it can be derived that the power of Purohita / also called a Hotṛ is represented as the sacred animal, a single horned bull of the seal, and depicted to be reciting the relevant Vedic stanzas of Yajña and therefore not the picture of any animal in particular. The concept of representing the head priest as a single horned bull, seems to have been in vogue even during the medieval architecture. The two pictures of the panels on the outer walls of the temples provided below depicts the sage Rishyashringa, who conducted the ‘Putra Kamesti Yajna’ for the king Dasharatha. The first picture shows Rishyashringa with the bull’s head and single horn of an antelope, offering the prasada to the three royal queens of Dasharatha. The second picture, also of Rishyashringa with the single horn on fore head, was the head priest offering oblations to Agni and conducting the yajna. Rishya shringa is a composit word of Rishi +shringa, where shringa variously means horn, summit,height of perfection, a crag -meaning the projecting part of hard surface. Horn is a symbol of self-reliance and strength. Rishyashringa as the chief priest (with a single horn) conducting Yajna for Dasharatha and royal queens. This is a conclusive proof to the fact that the head priest was symbolized as a bull with a single horn and Yajnopavita as a concept in Indus seals was later changed to anthpomorphic form of man with bull’s head and single horn. 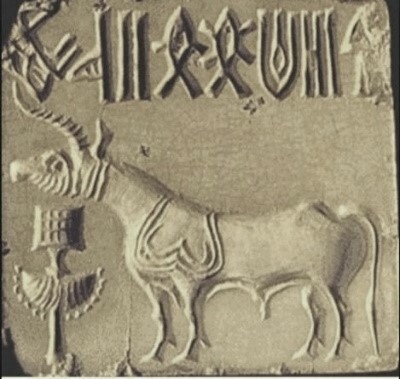 The Vedic period, which witnessed the peak of poetic skills emerging as Vedas appear to be the inspiration for the making of seals because the theme of many Indus seals when analyzed appeared to reflect Vedic contents, more like the literary and archaeological data of the ancient civilization. In other words, the seals are a faithful representation of Vedas through symbols and nothing appears to be beyond the scope of Vedas. Single horned bull is more as a concept or symbolism, rather than a direct depiction of the animal in an art form. The comparative study of Vedas and seal inscriptions revealed that the theme of seals strictly adhered to the data of the four Vedas and nothing appears to be beyond the scope of Vedas. In other words, the seals are a faithful representation of Vedas through symbols.